This is likely an "unvention" as Elizabeth Zimmerman would say: I know I am not the only knitter who has put an item into an envelope to send to a friend to find that it is just a teeny bit too thick to fit through the slot in the guide at the post office which designates it as a letter and thus requires just over a dollar postage, just that teeny bit too thick which means it shoots into the 'small package' category and the postage would be a bit ridiculous. 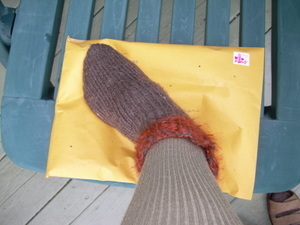 I brought the envelope back home with the intention of removing the cute little knitted buttons which seemed to be causing the extra thickness. But - darn, they were so cute and added that little extra which is, well - extra. Back went the items into the envelope and it was while I was re-positioning them and pushing here and there that I decided it was the spaces between the items that was the problem, that the air kept swooshing around inside and chubbed up the whole thing. That's when the "unvention" occurred: air in sealed envelope; knitting needles within reach; stab poke the pointy needle here and here and here and there; step firmly on envelope (having the presence of mind to remove shoe first with some idea that should some alert postal person notice the holes and wonder if perchance something that needed to breathe might be inside, the imprint of a shoe would not likely be a good idea); have air all be expelled and not seem to be sucked back in. I had planned to simply post the parcel at the post office and not risk the curiosity of the postal people but the thought of having the envelope returned for insufficient postage made me hand it over for the slot test. I held my breath and the package must have done the same because it slipped through easily, cute buttons included. Whew! 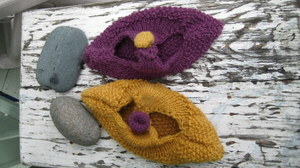 Here's what was inside - the pocket book slippers, on their way to a friend in Ontario. The buttons do add that little extra something: I am glad I 'futzed'. Pet rock ~ pet mouse: name? ; house? ; garment? It suddenly occurred to me that those 'pet rocks' from back in the Seventies have their modern day (inadvertent) equivalent: the computer mouse! Considering the amount of time spent with the mouse I realized, with a bit of a shock, that it does not have a name. The house has a name; the car has a name; the squirrels have names; the computers have all had names. Thing is, I am not sure of the gender of the mouse. Commodore .... PerCy .... Mac - the computers have all had guy names. Wonder if iRIS, PsyChe, MaMa were considered. This was more than six years ago! It now looks like this: it has a tear in the masking tape (which did not respond to being glued back down). It has had its eyes re-done many times. It is faded and looks worn. Hmmmm. Some serious consideration needed here! I would imagine this old percolator brewed some serious coffee in its time. It now stores yarn in the top part and the bottom section is perfect for keeping a ball of yarn in place while knitting. The knitting needles are jumbo plastic pick-up-sticks from the Dollar Store and they work surprisingly well for Knitting. This is a post from Sept 25 2007. I came across it while searching the archives for unique uses for objects. 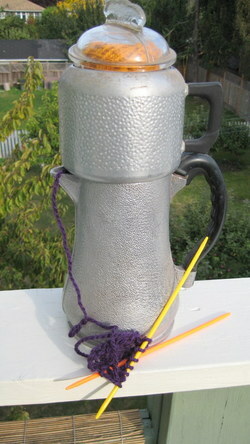 And this coincided with a wish to once again have a yarn holder while knitting. The old coffee pot somewhere over the last eleven years went elsewhere. I like the WIP and will give it a try to see what evolves further with such stitches. The antenna are now out seeking something unusual to perfectly suit being a yarn holder. A large annual community garage sale is coming up this weekend and there will be many items to consider. I've never seen a Blondie and Dagwood tie before so it was doubly pleasing to find this in a thrift store that is closing down. The young woman clerk did not know who they were and when I told her they were cartoon characters she said, "Oh, I think we had one with the Three Stoooges on it." How to cover a hanger with a tie is detailed back here.